Ladies, I am a tiny bit scared this weekend! I'm going to do something I've been thinking about for ages, it's been playing on my mind. I need to detox my clothing and de-clutter. Before I go through the emotional turmoil of throwing out clothes I don't need, I decided to seek advice from Nina Garcia's Style Strategy book. 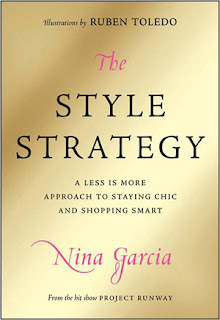 Nina, a fashion Director at Marie Claire US, is a big advocate of being wardrobe savvy and recessionista chic with clothes. A further tip Nina advocates is if you’re going to splurge on anything make it shoes. Nina says, buying shoes is the golden rule most fashionistas know. Nina dedicates a whole chapter on shoes, saying they can make a $20 outfit look like couture! Aruna Seth loves shoes as much as Nina Garcia, everything you say is SO true!